Call us at 503-591-5282 today! Pets have mastered the art of fun, haven’t they? They make the whole world their playground, whether it’s a ball, a new toy for chasing, or – let’s get real – the empty box the toy came in. As their caregivers, it’s up to us to make sure dangerous parasites don’t make a playground out of them! Heartworm, dermatitis and skin infections, tick-borne diseases, roundworms, and hookworms are just a few of the nasty things parasites offer, but no need to take your ball and go home! We’ve got the drop on those parasite bullies, because the parasite preventives we recommend are easy to administer, safe for your pet, and highly effective. As a bonus, protecting your pet from parasites also helps to protect your human family members. 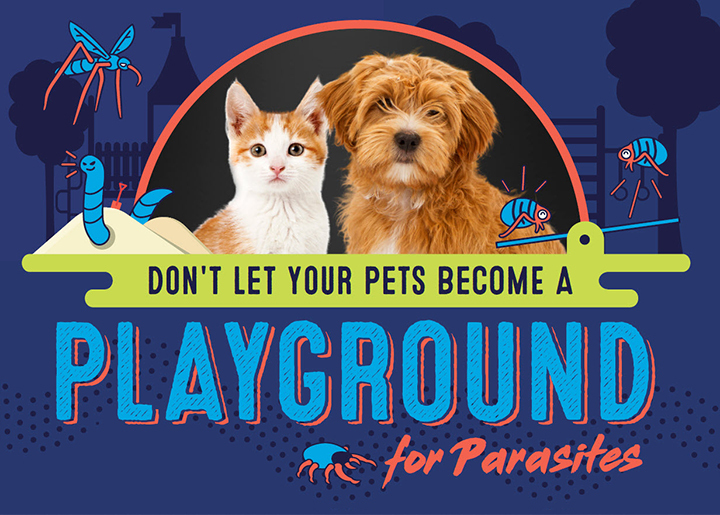 Many parasites and the diseases they spread can affect humans as well as pets, so your pet’s parasite prevention means peace of mind for your whole family. Learn more about zoonotic diseases here. There are many great options available for parasite prevention; in fact, deciding which is best for your pet can be like trying to pick the best player for your all-star playground dodgeball team! We welcome your questions and will make the best product recommendation based on your pet’s needs and your preferences. As your veterinary healthcare team, we’re here to help make sure you and your best pet friend enjoy plenty of fun and happy moments together. Call us today at 503-591-5282 and we’ll help you stomp out those parasite playground bullies and keep the pet playtime fun going strong! You may have heard in the news about counterfeit, unsafe, and illegally sold parasite preventives. This is a very big concern for pet owners, but it doesn’t have to be when you purchase via your veterinarian. You can trust us to purchase your pet’s parasite preventives directly from manufacturers or their trusted distributors.